For Secretary Robert B. Reich, the key to civility is listening — but perhaps not in the way we’ve grown accustomed to over the past few years. 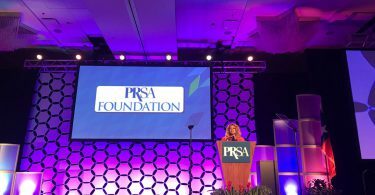 During his General Session speech at the 2018 PRSA International Conference, Reich reminded the audience of professional communicators that while the truth itself is iron-clad, perception and experiences vary based on the person and the background. Real listening is based around realizing that your specific outlook on life isn’t ubiquitous. “We are not communicating across boundaries,” he said. 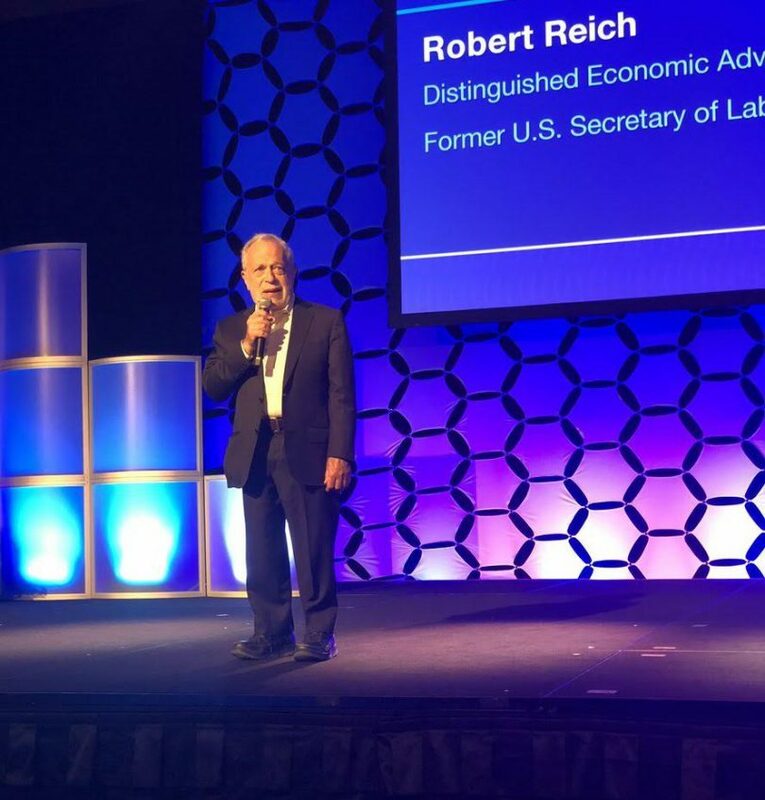 Though Reich is best known for his work in politics — he served as secretary of labor under President Bill Clinton from 1993 to 1997, and has written such books as “Saving Capitalism,” “Aftershock: The Next Economy and America’s Future,” and most recently “The Common Good” — his presentation barely touched on his time in power or the state of government in general. Instead, Reich discussed the connection between ideological disagreement and anger. How did we reach a point in America where simply talking to someone with another set of beliefs gets us so immediately upset? “We can’t learn anything if we don’t actually engage with people who have different points of view, which means breaking out of our geographic bubbles, our psychological bubbles,” he said. According to Reich, our ideological divide can be traced back to economic inequality, which has been growing significantly since the 1970s. Reich said that many U.S. adults don’t realize the fallacy of median wage statistics, which fail to represent the actual wealth divide. In fact, said Reich, if you use the median income as the only litmus test for whether the economy works for all Americans, then you’d think things are fine. In other words, life for middle-class Americans has gotten progressively tougher over the past 40 years. But because their struggle isn’t frequently thought of as a systemic problem, American adults assume it’s their cross to bear alone. This leads to people working longer hours and taking on additional jobs just to pay the mortgage. However, this outlook changed drastically after the housing bubble crisis in 2008. Instead of using this shared anger as a unifying force, Americans habitually sought comfort in people with similar theories on what was ailing the country — while keeping their distance from anyone else with a different viewpoint, said Reich. This has only exacerbated issues such as ageism and geographic tribalism. For instance, millennials may not think the same as baby boomers, and people who live on the coast don’t face the same pressures as people who live in the middle of the country. However, for Reich, these disparities in experience should be embraced — not used as a reason to stay siloed into our own perspectives. Americans are missing out on an insightful learning opportunity, and perhaps a chance to find some common ground in the process. Later on in his speech, Reich linked this lack of civil discussion to the media. In competing for our attention, he said, news organizations regularly pit people of different ideological backgrounds against each other. They exploit outrage and then feed it back to us. Reich told a story about partaking in a televised political debate, and how he was asked by the hosting network to be louder and more irate in his responses to increase the program’s chances of going viral. 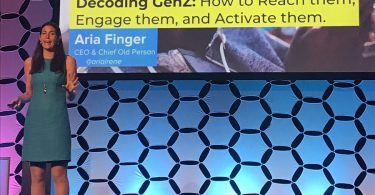 Though Reich stopped short of suggesting PR pros can mend America’s ideological divide, he did say he believes professional communicators can help set a better tone for the way people talk to each other.